The 'Little House' is only 100 steps from the beautiful white sand beach in Waveland and is located behind the Big House. 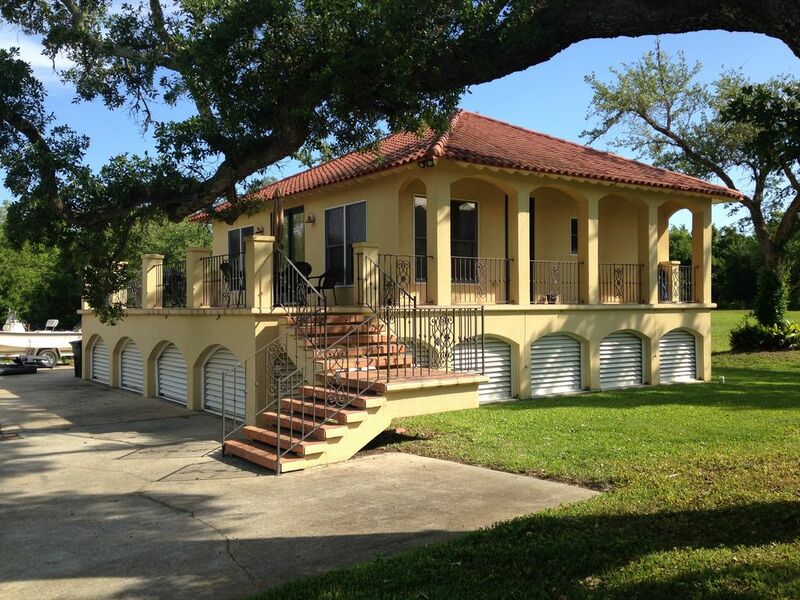 It is a 900 SF Mediteranean style stucco house featuring a clay tile roof and Mexican tile open deck. As you relax on the deck under the shade of the live oak tree, you have several views of the beach and a 300+ year old cypress tree. The grill is ready for your outdoor cooking. Inside, the very open floor plan has ceramic tile throughout the house and many double windows to add to the open feel. The spacious bedroom has a king bed and two large closets. The bathroom features an oversized whirlpool tub with ceramic tile enclosure and counter tops. The fully stocked kitchen has plenty of counter space and cabinets. The laundry room is equipped with a full size washer and dryer. From this location, you can be in the New Orleans French Quarter in less than an hour. On the way to New Orleans, you can stop by the Stennis Space Center Infinity Museum that features science and space exhibits. Traveling to the west on the beach road, you can visit the Waveland Public Pier for fishing and beautiful views of the water, stop by Buccaneer State Park for a little recreation and continue to the Silver Slipper Casino for a little gaming or eat in their restaurants. Traveling to the east on the beach road, you will be in Bay St. Louis in about 30 seconds. In 3 minutes you will be in Bay St. Louis 'Old Town' which has restaurants, shopping, antiques, a coffee house, and golf cart rentals. Hollywood Casino that features The Bridges golf course is also located in Bay St. Louis. This area is still rebuilding from Hurricane Katrina so it is very quiet and relaxing, but there is plenty to do and see!! We love living on the beach. We built the first 'Little House' in 1986. We were 'weekenders' for many years and dreaded going home on Sundays. When an opportunity came for us to move to Waveland permanently, we did! When Hurricane Katrina destroyed the 'Little House' and the 'Big House' in 2005, we built the smaller house first so that my husband and I could have a place to live while we designed and built the big house. We lived in the little house for 4 years and rented it to a friend for a year. The house was not being used so we decided to list it with VRBO because we had used VRBO several time ourselves and liked it. We like the personal contract with potential guests through e-mail and phone calls. The personal touch means a lot when renting from an 'Owner'! The house is only 100 steps to the beach and a great walking and bike path. The views and sunsets are great. The convenient location is only 3-10 minutes to the restaurants and activities in Waveland and Bay St. Louis. The "Little House" is behind the big house, but has great views of the beach as shown in the pictures! The "Little House" is behind the big house, but is just 100 steps to the beach down the driveway. Central AC Unit with digital thermostat. 2 sets of sheets for the king bed and 1 for the sofa bed. Full size washer located in laundry room next to kitchen. Full size dryer located in laundry room next to kitchen. 8 bath towels, hand towels, and washcloths. There is a sofa, 2 straight chairs and a recliner along with tables and lamps. Side by side with ice-maker. Electric with smooth cooking surface. Located above stove so it does not take up counter space. There are place settings for 4 with some extra pieces and stainless flatware for 8, and a full set of steak knives. Wine glasses. Fully stocked with plates, glasses, pots, pans, blender, mixer, etc. There is a large flat screen TV in the living room and a smaller flat screen TV in the bedroom. A selection of books are available for you to enjoy while staying here. Check with owner about bicycles. Includes a table with 4 chairs and an umbrella. Had a great relaxing stay even tho the weather wasn't the greatest. The cottage was super clean and very nice. I'll be staying again. My wife and I just completed our stay at the Little House and absolutely recommend it. We enjoyed the quiet, comfort and the long walks on the white sand beach. Darlene and Henry were terrific in every way possible. We were very comfy in the quiet little beach house. We had all the amenities we needed and our hosts were friendly and left us to our devices. We visited in December and had the beach to ourselves. A little chilly but beautiful and peaceful. I appreciate your review and glad that I found the item you left and got it back to you. We like to leave our guests alone but we are just a few steps away for recommendations or if there are problems at the Little House. Thanks again! Unlike some rentals that fall short of my expectations based on the pictures and reviews, this property actually exceeded my expectations. True to it's listing this property is just steps away from the beach, located just behind the main house. And because the houses on either side of the main house are built up on piers, one does have a view of the Gulf from several angles. I'm told this little house was where the owners lived while building their main house so it is very spacious and comfortable with a great layout. It has a full size kitchen that is well stocked with basic cooking and eating supplies. There is an electric stove and a dishwasher and the clothes washer and drier are closed off from the kitchen itself. The bathroom is very adequate and houses a tub with pressure jets in its side. There are plenty of towels available. The single bedroom has a king bed and plenty of closet space. It contains a separate cable TV. The bedroom has a door enabling it to be shut off from the main entertainment area which has its own cable TV. A new fold-out sofa in the entertainment area provides bedding for two kids as adults would most likely prefer the privacy of a closed bedroom. This room also contains a large recliner and another chair. The signal strength of the secured WiFi is excellent. A large French door opens from the entertainment area on to the outside porch which contains a portable BBQ. The entertainment area continues into the dining area which contains a large dining table with 4 chairs. The kitchen opens into the dining area. You will not feel cramped in this small house should the weather turn adverse. This property is located just within the Waveland city limits and is about a mile and a half from the Waveland public pier heading south on Beach Blvd. Heading in the other direction, you are only about a mile or so from the center of Bay St. Louis which boast numerous bars, cafes and gift shops. The Little House in Waveland is only about an hour's drive from the greater New Orleans area. Owner Darlene is easy to reach and quick to respond. The property was well maintained and immaculately clean. My wife and I thoroughly enjoyed our stay at the Little House over Thanksgiving week and look forward to a return visit in the future. Thank you for such an in depth review. You definitely expanded on my property description. I am glad that you enjoyed your stay here and hope that your wife was able to able to have her dental problem taken care of when she returned home. Thanks again and I hope to see you again. This was our second stay at the little house. We loved the relaxed feeling and hospitality of Darlene and Henry. We will be back again. Thanks for staying with us again! We love repeat guests! I think guests discover more about our little community each time that they visit. This is a wonderful rental property. We loved everything about it!!! We will stay here again for future trips to the MS Gulf Coast. Super clean and comfortable little house!!! Thanks for the great review. We hope that you include us in your future4 travel plans to MS and that you will have another wonderful stay!! Contact us for extended stay rates! We offer discounts for 5 or 6 night stays! 50% Refunded for cancellation less than 30 days before rental starts. 100% Refunded for cancellation more than 30 days before rental starts.